There was a fascinating programme on Radio 4 yesterday, the first of a two-part series in which Michael Morpurgo explores the teaching of reading. ‘As easy as ABC’ concentrated in particular on the push for synthetic phonics. There were differing views at the end on the crucial issue of how to bridge the gap between being able to decode and wanting to read. In next Tuesday’s episode Morpurgo will consider how past teaching methods are informing current thinking. 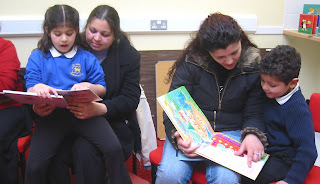 I love this photo of learning to read in action in a family literacy workshop I ran in Enfield.